I have a Big fat boy Liberty Safe, a couple wall safes, however after much discussion and a "reshuffling" of high value items, my wife and I wanted another small-mid sized higher security safe in our bedroom to store our Home defense AR15s, concealed carry handguns and a few random items we wanted out of reach of the kids. Sure, we even have an In-Wall safe in the house, however we simply had too much crap to stuff into another wall safe. Once again I looked toward Liberty Safe for a slim heavy-duty home security safe to slip into the closet and found their newer Revolution series of safes fit our size capacity needs. Liberty Safe’s Revolution series of safes are available in 12, 14, and 24 gun sizes however I choose the compact and slim 12-gun model for around $550 delivered. 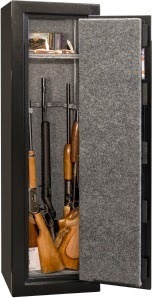 Liberty does have a less and more expensive lines of safes, however the Revolution line was designed around providing a lower cost safe option which still delivered a good fire rating and excellent security but is less full featured with simple internal wall coverings and just a single fixed partial shelf instead of a customizable interior and/or door organization pockets. The Revolution's finish, wall thickness, combination lock, locking mechanism, and door locking bolt count is also reduced and a step down from features used on the higher end safes such as my Liberty Fat Boy. At $520, it is still a very good quality safe, however Liberty wanted to provide a solid and secure lower cost option and needed to cut cost somewhere. Based on the four months I have owned and used the safe, I believe they struck a great balance between the very affordable prices and features of the the Revolution Series. One thing I would like to add to the safe is a set of Liberty's LED light kits to assure firearms could be accessed quickly even in the dark. The delivery was similar to my Fat Boy safe, however this time I elected to not opt for the in-home placement and setup and just used their standard curbside delivery option. Delivery took about six weeks due to a mixup on delivery scheduling and my phone number, however my new Liberty Revolution safe was dropped off in my driveway ready for me to unbox and unbolt from the delivery and shipping pallet. Of course the small shipping pallet was saved to get the Round Boy pizza oven ready for pizzas as a reward for lugging a safe up two flights of stairs and the heavy duty packaging was saved to be used for training targets on the range. I may not be the "greenest" guy on the planet, but I do like to eat and shoot, so in this case it worked out for the tree huggers. Once the Liberty Revolution Safe was freed from its packaging, I secured it to my 2-wheeled hand cart with ratcheting straps to give us something to grip and make the move and placement infinitely easier. Despite the weight of the safe, the move up two flights of stairs was surprisingly quick and uneventful with a light assist from Mrs Pandemic, however it was exhausting. Once in place, I slipped a 1/2" spacer under the front of the safe to level it and then secured it to the wall and floor with bolts to prevent movement or tampering. Unlike the rest of the the safes in the house we do not have this Liberty Revolution Safe loaded down yet. I say "yet" because I am sure the contents will grow again over time, however at the moment we have plenty of room in the safe and can easily and very rapidly access the contents. The features of the safe have been simplified, however it still has a couple notable internal features. The interior left, right and rear internal walls are lined with sets of standard wavy gun racks which will accommodate up to a dozen guns. There is a single middle shelf which still allows longer rifles and shotguns to be loaded into the safe without the shelf getting in the way. For the majority of homeowners, this is a very economical solution which secures the primary defensive guns in a small and unobtrusive footprint within the closet. We all go ga-ga over the newest firearm, however we need to set aside just a bit of our fun money funds to purchase a safe to avoid theft or unintentional tampering/curiosity of our beloved firearms. I do know of a father who came home to find his unloaded and cable locked Remington 870 stuffed with a grilled cheese sandwich by his son. Yeah, not the heart stopping conversation you want to have with the wife. A safe prevents that issue and provides a simple and fast accessible solution should the need arise. We generally dial up all but the last number before bedtime to speed up access should we need it. The Liberty Revolution safe does the job of securing your firearms and valuable all without breaking the bank in a footprint that handy… I just wonder if I need another one for guests in the extra bedroom in case this one gets too full. Dimensions H x W x D (Depth includes handle spokes installed; Add 1.5" for optional outlet kit) 59.5" x 18.25" x 18"
MIN. DOORWAY WIDTH CLEARANCE TO DELIVER SAFE* 18"
Exterior Depth (Includes handle spokes installed; Add 1.5" for optional outlet kit) 18"
FOOTPRINT (Width x Depth) 18.25" x 16"